Foliage fans and gardening enthusiasts from all over the country will love a day trip to the Elizabethan Gardens. Tucked away in Manteo within the Fort Raleigh National Historic Site, this 10 acre Roanoke soundfront locale is home to hundreds of species of native plants and wildlife, as well as rare and treasure varieties from all over the world, and offers a unique natural display with every visit. Vacationers who tour the gardens in winter will find a completely different landscape than summer vacationers, with camellias and magnolias replacing the mid-summer hydrangea and crepe myrtle blooms. But every visitor agrees that every single season presents a spectacular display, and visitors are encouraged to take their time, linger, and enjoy the combination of Elizabethan Era statues and landscaping and native Roanoke Island species. 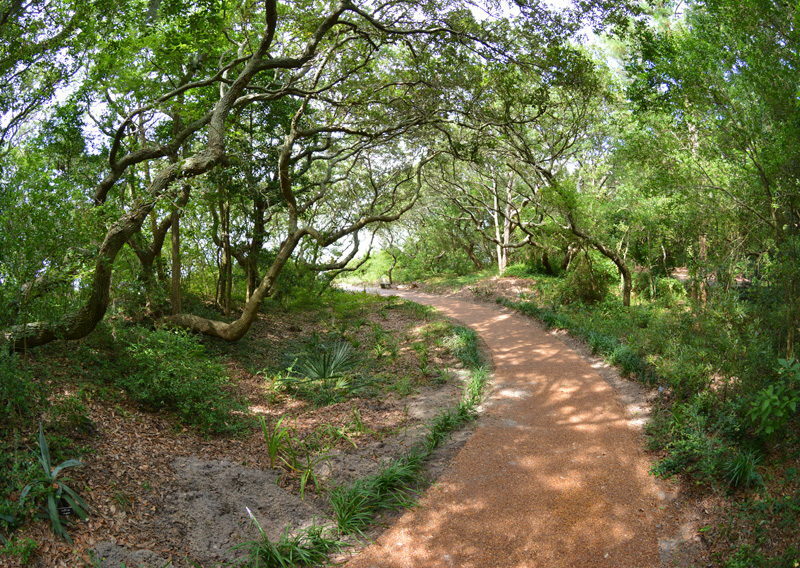 After all, the site of the Elizabethan Gardens is just yards away from the original home of the 1580s Lost Colonists, so it's only fitting that Elizabethan history and wild natural landscaping combine here to create an incredible Outer Banks attraction that's overflowing with beauty. The Elizabethan Gardens in Manteo is a welcome home to creatures large and small. Designations by ArbNet and NC Birding Trail tout the Outer Banks attraction’s commitment to the natural world. 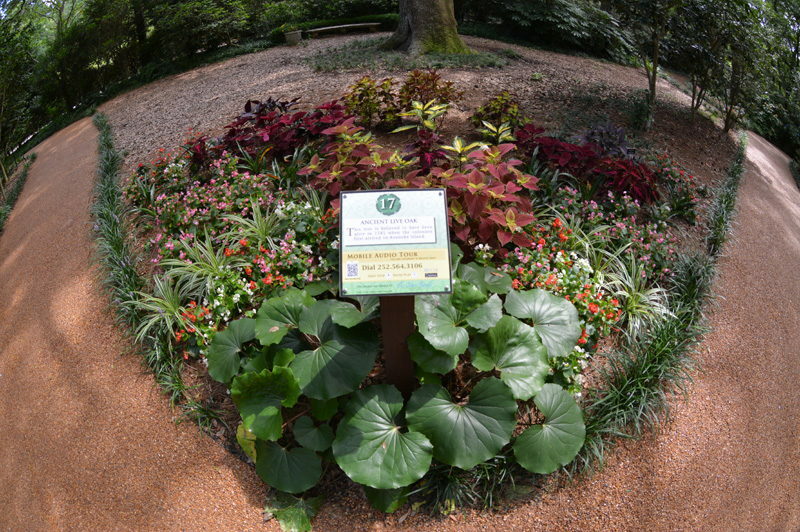 The Elizabethan Gardens is a Level II Accredited Arboretum with ArbNet. They feature 100+ species of woody shrubs and trees. Arbnet is a global network of tree-focused professionals that officially recognize arboreta based on a set of professional standards. The gardens are a proud part of NC Birding Trail, a partnership project of six agencies and organizations: NC Wildlife Resources Commission, NC State Parks, Audubon NC, US Fish & Wildlife Service, NC Sea Grant, and NC Cooperative Extension. The partnership was created to establish a driving trail linking known birding sites across North Carolina. On your next vacation, reserve a leisurely afternoon to see what's in bloom at the Elizabethan Gardens. 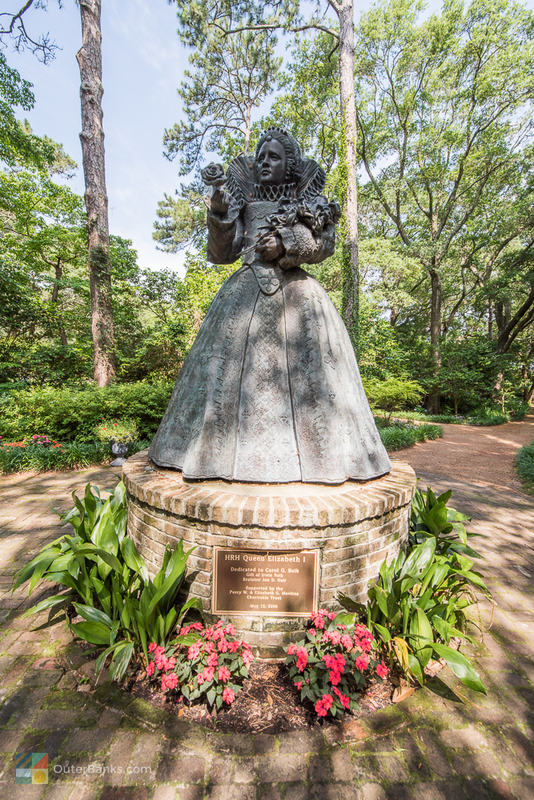 Honoring Roanoke Island's Tudor-era roots while showcasing the Outer Banks' most illustrious trees, shrubs, and plants, the Elizabethan Gardens are a must for anyone who loves a good stroll, a simply gorgeous landscape, and a complete breath of fresh air. In 1941 the Fort Raleigh National Historic Site became an official attraction for Outer Banks visitors, and just 4 years prior, the Lost Colony Outdoor drama opened within the Fort Raleigh grounds. Within years, both of these Outer Banks treasures had attracted thousands of visitors from all across the country, and in 1950, four very important Lost Colony show attendees would make their mark on Roanoke Island. Mrs. Charles Cannon, married to a North Carolina philanthropist, Mrs. Inglis Fletcher, (also a distinguished North Carolina historian and author), and Lady and Sir Evelyn Wrench, who was the founder of the English Speaking Union, had just visited the site and had taken in an evening show. Touring the grounds beforehand, it occurred to them that a two-acre garden on the outskirts of the Fort Raleigh site could lead to additional visitors, but more importantly, could stand as a natural and cultural monument to the Lost Colonists and Sir Walter Raleigh. They proposed the idea to the local North Carolina State Garden Club in 1951, and were met with enthusiastic agreement by its thousands of members. The initial concept was a modest one. The four original proposers as well as the Garden Club aimed to construct a simple two-acre garden that represented the typical garden of a late 1500's colonist - not a show-stopping display garden by any means, but rather a modest parcel of land that would have vegetables, grains, and other staples of a colonist's diet and lifestyle. But the plans changed when an assisting contractor, E.W. Reinecke, told members of the Garden Club about a prestigious historical garden he was dismantling at an estate in Georgia. The statues and fountains at the location were originally to be donated to the Metropolitan Museum in New York, but Reinecke suggested that the Garden Club contact the landscape architects involved, Innocenti & Webel, to see if this arrangement could be changed. The Garden Club followed through with the suggestion, and the members were surprised to find that the Innocenti & Webel landscapers were delighted with the idea of donating the historic statues to the site of England's first American colony. As a result, the original plan of a simple garden was revised to make way for the ancient Italian fountain and pool with balustrade, wellhead, sundial, bird baths, and stone steps and benches that the architects, as well as the original Georgia estate's owner, The Honorable John Hay Whitney, had reserved especially for the new Outer Banks garden site. With these donations serving as an abstract guide, the Webel landscapers designed an Elizabethan Era garden, slightly revised and remodeled for present times. Ironically enough, and perhaps serving as a good omen for this new direction, construction for the gardens began on the exact date that Elizabeth II was crowned, June 2, 1953. The task was an arduous one, and it wasn't until over seven years later, on August 18th, 1960, that the gardens were officially opened to the public on Virginia Dare's 373rd birthday. Since the gardens were first established, a number of remarkable pieces of art, statues, plant species, and even the bricks themselves have been donated to the gardens from generous benefactors around the world. 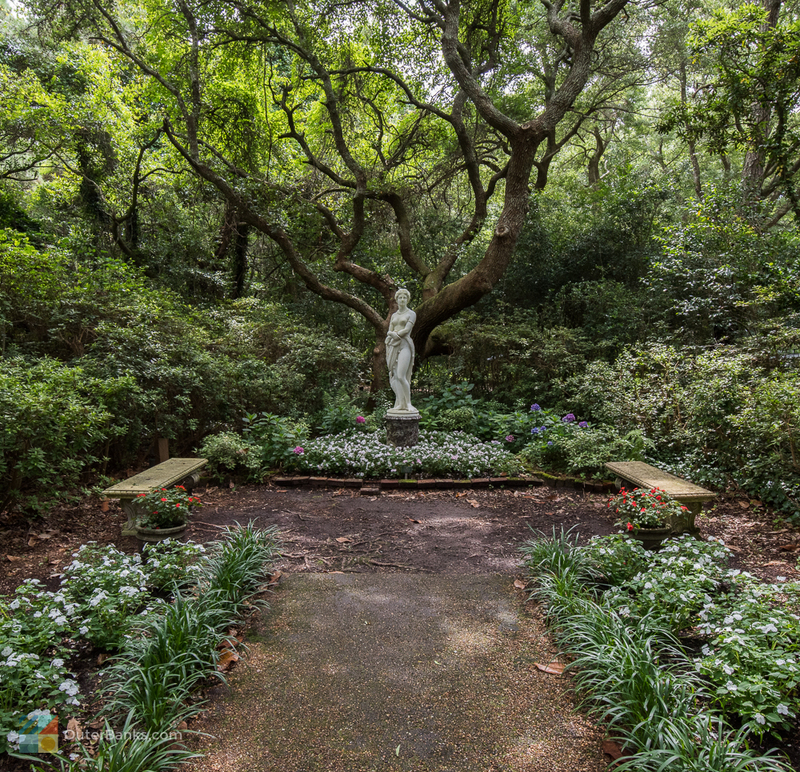 As a result, the gardens are an incredible collection of the old world and the new, with ancient English blooms and local trees and shrubs, all in an incredible setting that feels miles away from modern North Carolina, despite it's quiet location tucked away on Roanoke Island. 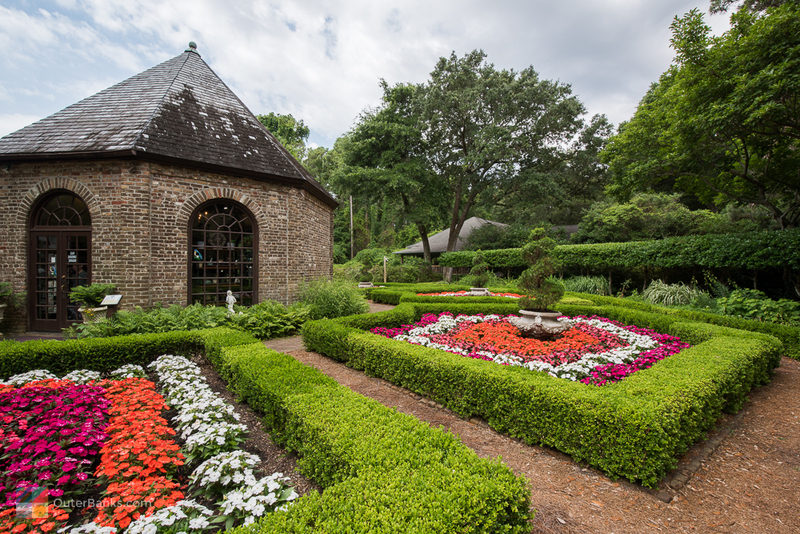 The first thing guests will notice as soon as they approach the gardens is the expansive and impressive Tudor-era gate house, bordered by a towering brick wall and a collection of shrubs and seasonal annuals and perennials. This grand entrance is structured after a 16th century orangerie with hand hewn beams inside, a flagstone floor, and a cross design gracing the wide front door. The broad iron gates that guards the entrance was in fact a gift to the gardens, and once adorned the French Embassy in Washington, DC. Travelling through the cool stone doorway, visitors will pop out into the main entrance and gate house gift shop. Here, guests will purchase their admission tickets and obtain their map of the gardens before stepping out into the great outdoors. While at the entrance, however, be sure and take a look at the artwork and ornate carvings that are sprinkled throughout the main gate house, particularly the oil portrait of Queen Elizabeth I that, when not on loan to national museums, hangs on the gate house walls. This portrait recently gained worldwide attention when it was estimated that it dated back to 1592, and as a result, may in fact be the "oldest" portrait of the queen painted during her reign. The queen stopped commissioning portraits as she aged, preferring to maintain her reputation and image as a young virginal queen that was so beloved by her people. As such, portraits of an aging queen that were actually painted during her lifetime are notoriously rare. If the work is indeed genuine, it may very well be one of the Elizabethan's Gardens most valued treasures. Visitors should also be on the lookout for a map of Devonshire from 1663, (the English area where many of the Roanoke Island colonists were originally from), as well as a steel engraving from the Compton castle in Devon, England, where Sir Walter Raleigh may have visited as a small child. After stepping outside the main gate house, visitors will be greeted with a sprawling and well-manicured front garden, which feature seasonal blooms and a small side garden with over 45 varieties of herbs scenting the air. The centerpiece of this display is a white Carrara marble fountain, inspired by Elizabethan times. The small, shaded paths that lead from the individual gardens are named after the species that are planted there, such as the Rhododendron Walk or the Hornbeam Walk. Like all areas of the gardens, the paths feature seasonal blooms, from bright red and pink camellias in the winter to striking hydrangeas of all colors in the summer. Continue strolling, and you'll also encounter the Fragrance walk, which not only features a number of sweet-smelling blossoms, but also passes several of the gardens' active greenhouses. Guarded just a few yards away by a towering Queen Elizabeth I statue, visitors will find the almost hidden Queen's Rose Garden, which was added in 1976 and honors Queen Elizabeth II. In this charming small parcel, which is lined with cobble-stone walls, dozens of roses border a 500 year old sundial donated from the original Whitney collection. Here, visitors can literally stop and smell the roses, or at least admire them, including an English rose bush that was donated to the gardens by Queen Elizabeth II herself, and originally comes from the royal rose garden at Windsor Castle. Farther down the path lies a statue of Virginia Dare, or rather, what the original sculptor believed Virginia Dare would look like had she grown up on Roanoke Island. (Virginia Dare, after all, was only an infant when the Lost Colonists disappeared from the face of the earth.) Carved in 1859 in Rome, the piece had a stormy history before it was donated to the gardens - it had survived a Spanish shipwreck, a controversial display in the Raleigh State Hall of History, and a long stay at Pulitzer Prize winning playwright, (And Original Lost Colony play author,) Paul Green. Today, Virginia Dare is admired by thousands of annual visitors, as she stands with fish nets in hand under an ancient Live Oak. 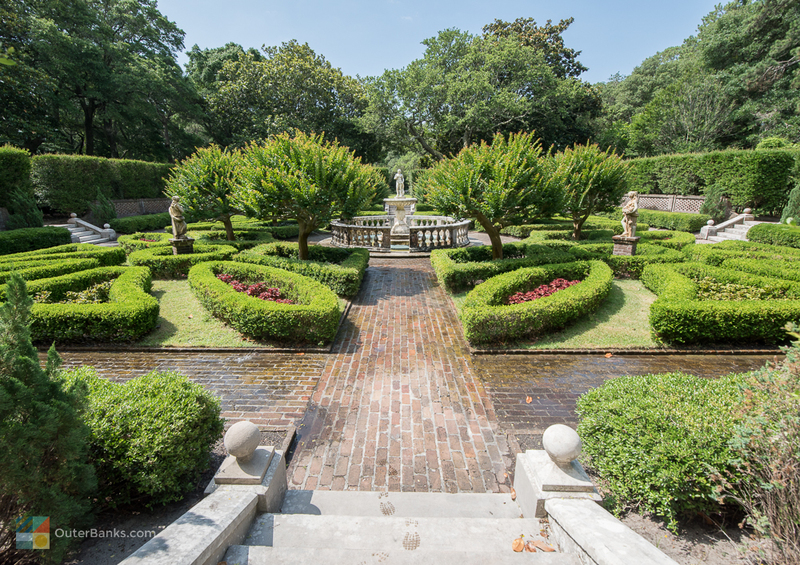 In the center of the gardens, visitors will find one of the most stunning attractions, and one of the gardens' most popular locales for small outdoor weddings, the Sunken Garden. 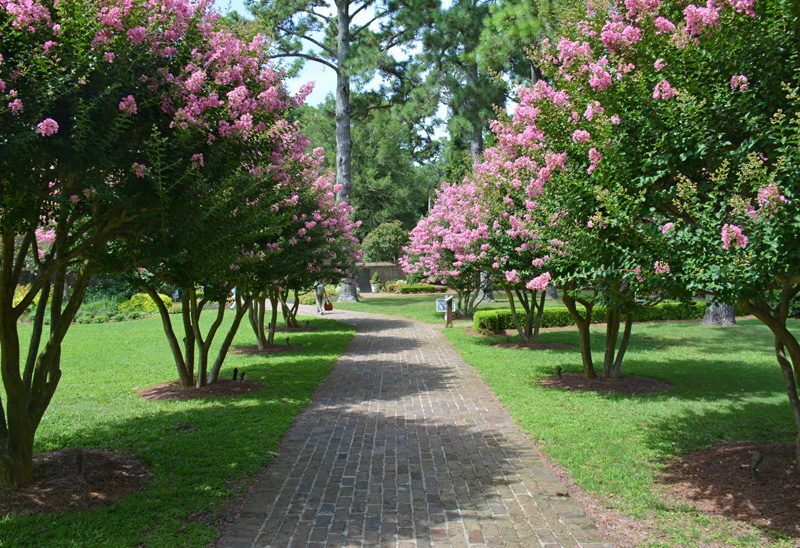 This square central patch is bordered by three flights of stairs, leading down a collection of 32 identical parterres bordered by hedges of yaupons, consistently changing displays of flowering annuals and perennials, and two towering deep pink Crepe Myrtles that bloom 100 days out of the year. These Crepe Myrtles flank the ancient Italian fountain and pool, another Whitney collection original, which over the years has been a popular wishing spot for visitors who toss their pennies into the cool waters. Towards the back of the gardens, visitors will find a peaceful Roanoke Sound overlook that's best enjoyed from the vantage point of the neighboring 16th century gazebo, an authentic replica that was added to the gardens in 1981. 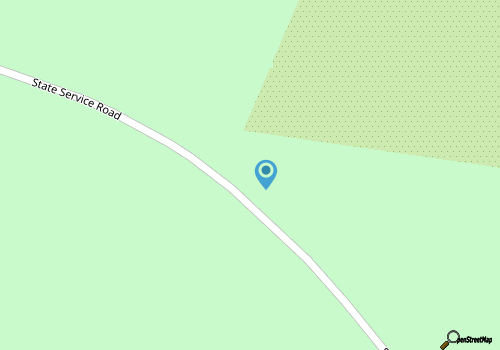 Because this area in particular overlooks both the Roanoke and the Currituck Sounds, it's entirely possible that this was the exact spot where Sir Walter Raleigh's cousin, Sir Richard Greenville, first stepped foot on Roanoke Island in 1585. The one empty expanse of the Elizabethan Gardens, which is not adorned by any flowering blooms, climbing roses, or even local live oaks and cedars, is the Great Lawn. This area has been intentionally undeveloped, and serves as a performance space for seasonal Elizabethan Masques, Easter Egg hunts, and other special events and activities. At the very back of the Great Lawn, lies one of the garden's oldest living residents, an Ancient Live Oak that horticulturists believe was alive and well when the colonists first landed in 1585. Once visitors have completed their circular tour of the gardens, and return back to the main gate house, they are encouraged to make a stop at the small gift store and outdoor plant store. Here, visitors can purchase actual plants, bushes, flowers, and trees that were grown within the Garden's grounds. Seasonal varieties for sale include camellias, beauty berries, butterfly bushes, roses, hydrangeas, and countless other species. Visitors can expect the entire tour to take an hour or two, but are encouraged to linger, and simply enjoy the breathtaking beauty of each individual "garden" within the gardens. 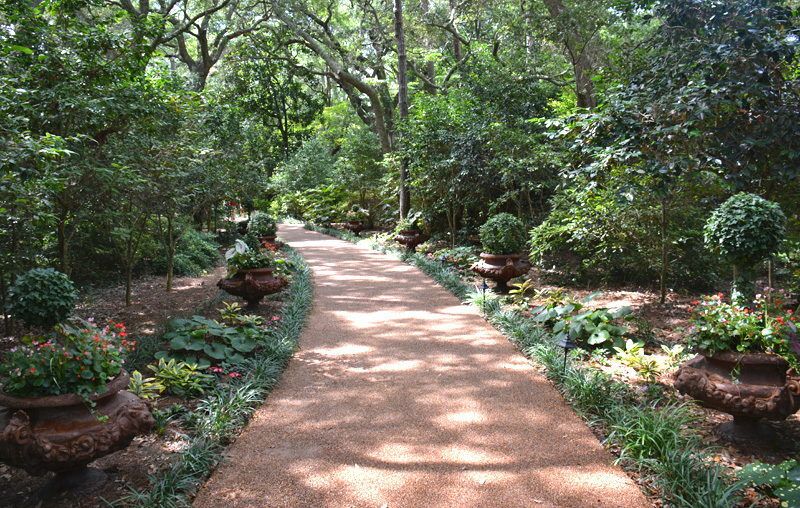 After all, at the Elizabethan Gardens, a relaxing shaded stroll is always in season. Families of all ages are always invited to stop by the Elizabethan gardens to see what special events, classes, workshops or seminars are being held. The gardens have an extensive events calendar, which is available online, and covers a range of activities from special programs for kids to week-long workshops. Locals and frequent visitors are also encouraged to sign up for the Elizabethan Gardens E-Newsletter, which outlines upcoming workshops or seasonal plant and gift store sales. Some of the most treasured recurring events on the calendar, which are available throughout the year, are arts and crafts workshops that are orchestrated and taught by local and visiting artists. Classes can be anywhere from two hour wreath-making sessions in the gardens' extensive reception center, to full two-day workshops that take place in various nooks and crannies throughout the garden grounds. One of the most popular of these sessions is a seasonal two-day watercolor class, where attendees can combine their love of nature and art to learn more about how to capture the beauty of what's in bloom. In addition to special workshops and classes which can change regularly depending on the instructor or sponsor, the Elizabethan Gardens also has a range of annual events, which are regularly celebrated every year and are open to the public. Every spring, the Elizabethan Gardens hosts the Easter Eggstravaganza, a celebration of spring that includes all the fun traditional Easter activities that kids love, such as egg roll races, a hat and Easter bonnet contest, and an extravagant Easter Egg hunt beginning at the Great Lawn. Families of all ages are welcome at this extraordinary fun springtime event, which is included with the cost of admission and is free to members. In the fall, families are once again invited to come celebrate the season with the annual Harvest Hayday. This autumn themed day-long festival features a hay maze, a scarecrow building workshop, face painting and balloon sculptures, corn hole games, pumpkin bowling, and even hay rides throughout the gardens. Other games and activities are added every year, and children will have a fantastic time celebrating the oncoming Outer Banks fall. As the day winds down, the Great Lawn is transformed into the romantic and tasteful setting for the Diamonds and Denim dinner dance. This annual charity event helps raise money for the gardens through good live music, great food, plenty of dancing, and even live and silent auctions. The Elizabethan Gardens really celebrates the holidays with an end-of-year event that has become known in local circles as one of the best and biggest holiday celebrations on the Outer Banks. The Winter Lights at the Elizabethan Gardens kicks off with a Grand Illumination, where visitors are welcome to witness the official "turning on" of over 1 million holiday lights that are placed throughout the gardens, making the 10 acre site sparkle and illuminate the dark Roanoke Island nights. Once lit, the Elizabethan Gardens Winter Lights display is open for visitors for nearly an entire month, from early December to just after New Year's, and is seasonally open late so winter visitors can enjoy a quiet evening stroll surrounded by the countless twinkling lights. Enhancing the holiday mood are seasonal decorations, a small Christmas village on the Great Lawn, a cozy outdoor fire, and free hot chocolate for all visitors. For one of the best light displays in Eastern North Carolina in one of the most romantic and tranquil locations, a visit to the Elizabethan Gardens' Winter Lights display is simply a must. Newcomers are surprised and delighted to learn that portions of the gardens are available to rent for weddings and other special events. Consider spending your child's next birthday party on the Great Lawn, with the garden's two-hour party package. The celebration includes a fun-filled garden education program of your choice with a take-home craft, a goodie bag and small planting for each attendee, ample space to celebrate and open presents, and a guided tour of The Elizabethan Gardens. Educators and artists can also contact the Elizabethan Gardens to inquire about conducting classes or reserving special guided tours throughout the gardens' most prestigious or even lesser known areas. In recent years especially, the Elizabethan Gardens have also become a particularly attractive locale for both visiting and local couples who want to wed with the beauty of the gardens in the background. Various areas of the gardens are open to brides and grooms, and can accommodate various sized events. For example, large parties of 100 attendees or more can congregate on the open Great Lawn, while smaller ceremonies can be held almost anywhere - overlooking the sound near the thatched gazebo, in the Queen's Rose Garden, or in the garden's romantic sunken garden overlooking the Crepe Myrtles and original Italian fountain. 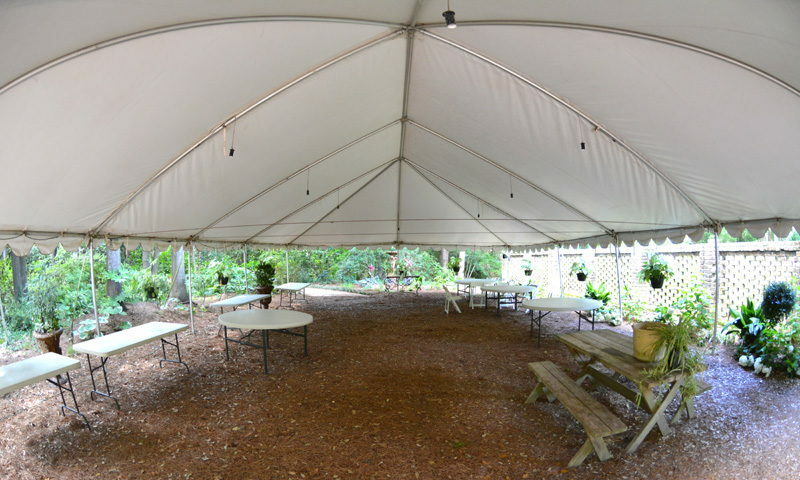 The Elizabethan Gardens also has a large reception center, which provides indoor accommodations for rainy days, as well as plenty of space, set-up room, and outlets for caterers, bands or DJs, and other essential wedding vendors. The Elizabethan Gardens do book up quickly, so if you are planning an upcoming wedding, reserving the site early is key. The site's event hosting generally includes rental of various, specified areas of the gardens for two hours (or more if requested), white chairs, and access to the garden's Special Events Coordinator for questions and guidelines. Couples are required to contact their own vendors for tent rentals, music, and catering, however the Elizabethan Gardens can provide the bride and groom with a list of preferred area vendors who are familiar with the gardens and the set-up involved. The maximum capacity is 300, but even parties of just two are welcome, and couples will find that the various settings throughout the gardens are perfect for a natural, romantic, and truly Outer Banks affair. All special events can be arranged through the garden's Special Events Coordinator, who is on call to answer questions. Vacationers who find themselves drawn back to the Elizabethan Gardens year after year may want to consider becoming an actual member. Members receive free admission passes to the gardens at any time, (including special seasonal events like the Harvest Hay Day or Easter Eggstravaganza), a 10% discount at the gate house gift store and plant shop, a quarterly newsletter, and exclusive advance notice to all upcoming events. Rates range from the Azalea pass for 1 annual student admission ticket to the Ancient Oak pass for 10 free admission tickets. If you find yourself returning to the gardens season after season for the solitude and the ever-changing blooms, then an Elizabethan Gardens is certainly worth looking into. The Elizabethan Gardens have enchanted millions of visitors since the attraction was first conceived as a simple peasant's garden, and eventually transformed into 10 acres of incredible beauty, world renowned statues and paintings, and ever-changing flowers and bushes from all around the state and the world. For a tranquil afternoon off the beach exploring the great outdoors, as well as enjoying a natural tutorial on the rich history and Elizabethan Roots that put Roanoke Island on the map, be sure and plan an outing to the Elizabethan Gardens on your next trip to the Outer Banks. Our current hours are 9am to 6pm. Call 252-473-3234 for current hours.